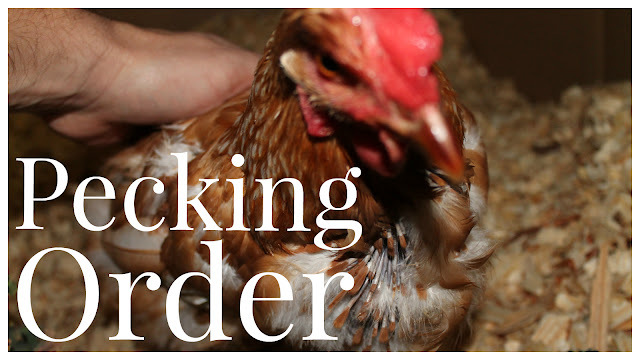 What do you do when one of your chickens starts to get picked on? In every flock of chickens there is a pecking order and sometimes the weaker smaller birds will start to get bullied, mean old chickens. We have not had any issues with this until just recently when we started noticing a lot of feathers scattered around the run and coop. I started to investigate a few days ago and witnessed one of the larger chickens chasing the smallest one around and literally pull its feathers right out! Not just one at a time but bunches at once. I hoped that it would just lay low and heal up and all would be well in the SSL flock. I could not have been more wrong, by the next day there were more feathers and more bald spots on the hen. I was starting to get concerned especially since it is winter here in Michigan and temps were dropping into the teens at night. Each day I would check on the hen and see that it had bunkered down in one of the nesting boxes; basically hiding from the rest of the chickens. I tried to feed it some scraps of food and gave it water. Last night I went out to put the chickens in for the night and I opened the box to check on it and noticed blood all over the tail and wings. It was time to do something to help this little egg producer. After some research and based off of what I have seen once the flock draws blood they will not stop until the hen is dead. There is something about the look or smell of blood to them that makes it irresistible and they will actually eat the chicken alive basically. Now, I know what some of your are thinking, take it to get slaughtered or put it out of it's misery. Well, no, not going to happen here. Number one I live with 4 girls in this house and if I wanted to continue to sleep inside I don't think that is an option. Number 2, the meat is no good at this age and this chicken still has a year or two of egg production left so I want to save our investment. And, oh yeah, I don't like to see the little runt chicken suffering! At this point the only thing you can do is separate the chicken from the flock in some way. In our case, the easiest thing to do is to bring it inside our basement or garage and let it heal up. I had and old dog crate that will work just perfectly. Since our garage is a mess right now the basement seems like the logical choice. Is it weird that I now have a pet chicken in the house? The answer is, yes! But, it is nice to be able to go down and collect an egg without having to go out in the cold so there is that to think about. Maybe I should move the coop inside too! Don't tell my wife that I said that or seriously, it will happen. I will give an update on this little hen down the road after a full recovery. My only further concern is will it happen again? I may have to separate the bullying chickens for awhile when I reintroduce this one but either way I will take you along and let you know how it turns out. Good luck to all you chicken owners out there and as always let me know if I can help anyone out there in anyway. Have a good one! Did you get your chicken integrated? We use to put a new chicken behind a fence so they could go eye to eye, but not touch for a couple weeks and then when ther were ready we put the new chicken in the coop at night when they were tired, seemed to usually work. Hi there! We are almost finished with the whole re-integration process and mixing up their pecking order, and we are extremely happy to report that it is going well! It hasn't been easy and it's taking quite some time, but we have six chickens living together again fairly harmoniously! Thanks so much for following along!